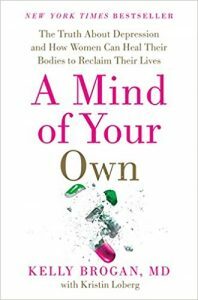 A Mind of Your Own: The Truth About Depression and How Women Can Heal Their Bodies to Reclaim Their Lives by Kelly Brogan, MD HarperWave, New York, 2016. 337 pp. Dr. Brogan illuminates the true cause of our rising epidemic of depression which is more than a chemical imbalance. She provides the science connecting this message from our bodies about our lifestyle crisis that needs a reset, and our interconnected systems in the body that need to come into a balance zone –think blood sugar, gut health, thyroid function, and inflammation for starters. Dr Brogan is a practicing psychiatrist with a degree in cognitive neuroscience from Weill Cornell Medical College and NYU School of Medicine. Holistic methods focus on nutrition, meditation, and physical activity – what some practitioners call lifestyle medicine because the approach involves changes in everyday lifestyle habits – are entirely evidence-based but virtually unknown in this age of the quick fix with prescription drugs. All of Dr. Brogan’s depressed patients want to feel physically vibrant and emotionally balanced, which is their birthright – not perpetually drained, unsettled, mentally foggy and unable to enjoy life. At present, in the United States, one in seven women are medicated on antidepressants. Under the guidelines in this book, her patients have achieved their goals and healed their minds, moods and memory. Dr Brogan is also a specialist in perinatal or reproductive psychiatry that focuses on the risk-benefit analysis of treating women during their reproductive years, a uniquely vulnerable time period for both the woman and her fetus. She divided her book into two parts. Part 1: “The Truth About Depression,” takes you on a tour of your mental health’s friends and enemies, from everyday foods to common prescription and over-the-counter medications. She exposes a stunning relationship between your gut’s health and mental health within the context of inflammation. She also gets into the epigenetics of gene expression directly related to mood. Part 2: “Natural Treatments for Whole-Body Wellness provides guidelines and an action plan to regain clarity of mind and spirit, enhanced energy, and an unwavering tolerance for distress. What Dr. Candace Pert demonstrated with her book, The Molecules of Emotion, Dr. Brogan has shown in this book decoding depression. Depression can result from bodily imbalance rather than brain chemical imbalance. This book is a gift for anyone impacted by a depression.